The bottle is marked with a series of notes: Concerto Barley, Broomhall Farm, Glenmore Spring, Long Fermentation, Slow Distillation, Oloroso PX. Identifiable, Unpronounceable. 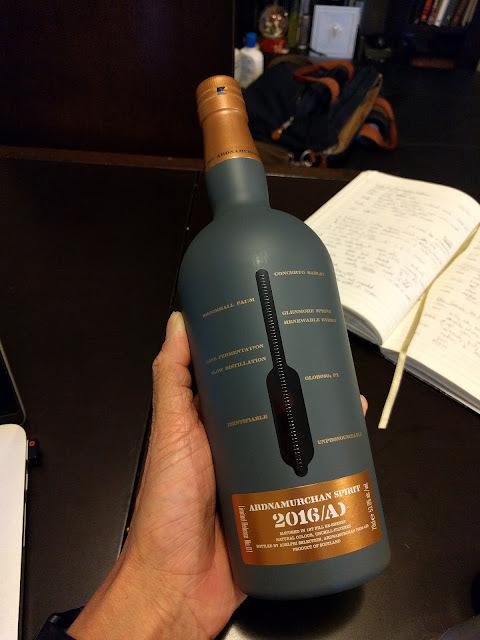 There I was looking at a the newly released spirit bottling from the Ardnamurchan distillery; the Ardnamurchan 2016/AD. It has been labelled as a 'spirit' instead of 'whisky' as the first release is merely 18 months young. This was Ardnamurchan's preview release, a release which aims to get their name out in the market and most importantly, to give us all a sneak peek at what to expect from the distillery in the coming years. 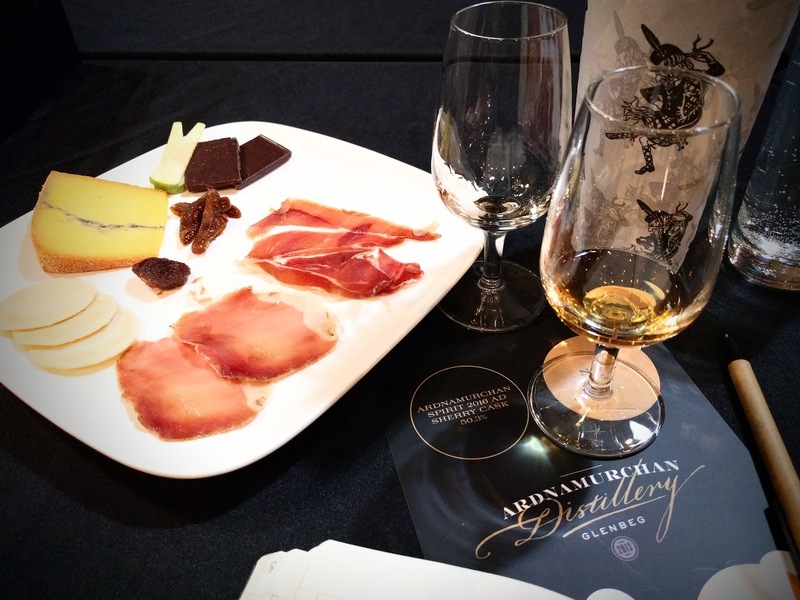 The Ardnamurchan Distillery was opened in July 2014 by Adelphi; the independent bottler that we all know and love. The distillery sit on a remote part of Scotland, on the shores of Loch Sunart and produces two styles of spirit - peated (30 ppm) and unpeated. Local barley is used and the distillery feature two mash tuns, a wooden washback and a 10,000L wash still. With a total production capacity of around 300,000L per annum, the production potential for Ardnamurchan is huge for a young distillery (contrast this with Kilchoman's capacity of around 110,000L per annum). Though in noting that, current production capacity is still managed at around 100,000L per annum - equivalent to around 30 casks each week. The youthful Ardnamurchan 2016/AD combines both peated and unpeated malt matured in two different types of sherry cask - Oloroso and Pedro Ximinez, and the vatting of the two malts has resulted in a spirit that is both interesting and exciting. An interesting young spirit from Ardnamurchan that does not smell or taste too strongly of a new make. In fact, surprisingly, you can derive so much from this young spirit - from its herbaceous and earthy nose to its soft, sweet and slightly peaty palate. It will be interesting to see how the Ardnamurchan spirit matures over the years given the already pleasant base that it offers now. Nose: The nose is filled with notes of apple, sweet raisins and lightly herbaceous, there are remnants of dry grass and soil and it is rather quite earthy. Over time, the nose also offers a touch of cinnamon, complementing its herbaceous and earthy notes. Palate: The palate is soft, tannic with loads of berries, citrus and is quite sweet and fruity. The citrus continues with hints of orange peel, lemon meringue before being topped by a light layering of peat smoke and remnants of clove spice. Finish: The finish is medium to long, soft and tannic and there is a bit of heat on the finish. On the night, Adelphi being Ardnamurchan's parent company also presented a few Adelphi bottlings - the Glenborrodale Batch 3 Sherry Cask release and my favourite on the night, the Glen Garioch 1998 Sherry Cask release. All the bottles are available for purchase from the Oak Barrel though you might want to be quick with the Ardnamurchan as there are only 2,500 bottles globally and local allocation is quite limited.